For those who are new to this topic and wish to build this simple esr-meter I warmly recommend to read all the four pages because from the first post that I made, there were some significant changes that will improve the esr-meter, these changes were contributed and ironed out by the users of the forum, also reading the pages you will find a lot of answers. Thanks goes to the users who improved this simple solution and fixed bugs! This is my first for a "project" on a forum and playing with electronics is a hobby so please take it as is because this is just amateur work, everything is perfectible. Skip if you find this kind of boring. First I'd like to thank to dr. Le Hung here (http://members.upc.hu/lethanh.hung/LCFESRmero/en/index.htm) for the idea of this simple ESR schematic, he sells a kit for the ERS-meter but also features capacitor and inductance measurement. Second: I'd like to thank the user tinhead on this forum (http://www.eevblog.com/forum/index.php?topic=1571.0) for making it easy for me to choose which scope to buy for tinkering with the current project (thanks for his work on Hantek DSO50xxx series). Third thanks for all those people who post and share useful info and projects on the net! For those who are wondering what is ESR -> Wikipedia (http://en.wikipedia.org/wiki/Equivalent_series_resistance). The idea behind this ESR is this: Using the well known formula U=I*R, we will pulse very shortly with a known current the cap or resistor, measuring the voltage on the element we have the necessary information to calculate the resistance. There would be a lot to write about this method and why this is functioning but probably more interesting is hand on experience. The code: I tried to comment it at every step, it is written only for the 50mA current but very easily can be modified to add more upper range to the measurement (the hardware part is ready for this). Code could be rewritten for better performance using interrupts, etc, here is just a basic idea that works. The hardware: Schematic is provided below, I designed a shield to arduino, probably not the best layout, be aware that the pcb was not tested yet and I'm not 100% is correct, did not use auto route and tried to make it single side, the schematic is good for sure and tested. The DUT should be connected to CN1 between GND (pin3,pin4) and pulse and AIN0 (pin1,pin2) using a setup with four wires. //while fully saturated idealy is at 0 ohm. 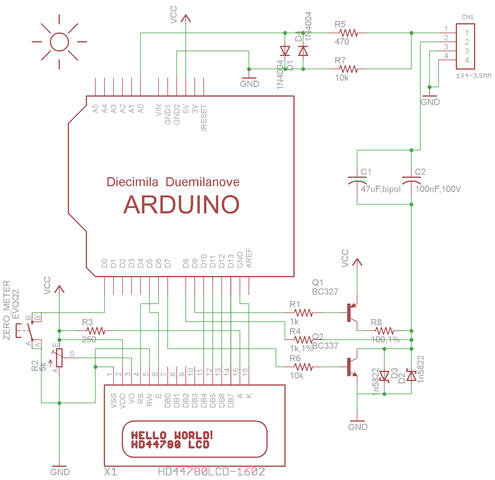 Thank you all for your appreciation, for the schematic I used the Eagle Cad with freeware licence and the adafruit library (you can find it here http://www.adafruit.com/blog/2010/02/05/b00m-adafruit-eagle-library-an-arduino-package/). Good question, the smallest capacitor I played with was 4,7uF value, this was not a problem to measure, the code presented here uses only the 50mA branch of the schematic (through R8 and the transistor), using the 5mA branch (through R4, the code must be adapted a bit) lower value capacitors can be measured (the smallest cap value that can be measured accurately I don't know). I don't have an reference instrument to compare with, but I guess if one needs to compare two capacitors and sort out the one with the smallest ESR this can be done easily with the current schematic, eventually the schematic can be modified for a lower current (increasing R4's value) so that when the current is applied to the DUT will not charge the small capacitor to quickly and distort the reading (increasing frequency should be necessary to), maybe another schematic with a true sine 100khz constant current generator or even at higher frequency as this is important for the small value capacitors can give better results. Sorry I don't have now this on my breadboard and can't test it. Probably the best way to know if this schematic is good for such small capacitance (pF, nF range) is necessary to study a bit the theory behind ESR measurement and make some calculation to know at least the theoretical limits of this device. I just took a peak on the net and got to this page where is a calculator for reactance (http://www.electronics2000.co.uk/calc/reactance-calculator.php), as it turns out we must use a frequency where reactance will be negligible versus ESR, as this schematic uses aprox. something around 60khz (more or less) reactance becomes an issue beginning with the nF range, for pF we need something with several Mhz oscillations. Sadly the answer is no measuring the ESR for (pF) range with this schematic, only the upper range of nF (even here reactance should be taken in account). One question, how do you seperate ESR from ESL? Some capacitors, especially those designed for low frequency use, can have very high inductive reactance. I don't think your device can distinguish this. You may think you have a cap that has very high ESR, but, in fact works very well at 120Hz, not so good at 10KHz. Good point, probably one way would be to test the capacitors at two different freq. high an low plus measuring the capacitance (computing the ideal values from capacitance and freq to get the ideal reactance and inductance) and than analyze the outcome comparing all the values and decide upon this result for a proper verdict of what the cap is good for and where it can be used, would be nice to have some capacitors with the same value and different ESR and ESL to test for this variable, the sketch could be modified to use different freq. This gives me an idea of a sketch where we could analyze the capacitor's response on a frequency range and plot the value and compare this to the ideal capacitor. I am new to Arduino. I have a I2C 1602 LCD module. I am trying to use it with your code. I had to comment out 2 lines to get it to compile. If you could look at it and tell me if I need to modify this code for it to work. they have no important role in the code, they just control the back light on my display and another LED. For any questions I can answer I will help gladly. I do not have any bc337 npn trans in my parts bench. I do have some 2N4401 . Will this be a suggestible replacement ? 2N4401 as I see from datasheet should do the job. The lcd I am using is only useing a 2 wire (A4, A5) to show info. I am confused on the schematic as it uses several connections to the lcd . I am worndering how to wire up the push button ZERO with my 2 wire LCD display. I have bread boarded this project and the displays reads(Zeroing Done saved to EEPROM) , it is like it is stuck in a loop . I thought I may be doing something wrong so I used Proteus to do a simulation and I get the same reslut. Can you look at the schematic and see if I am doing something wrong.